1. 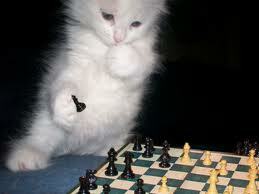 Kitten ChessKittens are basically the natural world’s equivalent of iPads. Everyone wants one except some people who don’t, but no one really cares what those people think anyway. If my pillow became an animal, it would be a kitten and I’d be totally fine with it sleeping on me instead of the other way around. Anyway, imagine how awesome it would be if you could play chess using kittens as your pieces. Knight takes pawn? NO! Tabby takes tortoiseshell! It would be so freaking cute I don’t have words. Also, when a piece got taken you could just pet it and love it and hug it and OOOH ITS SO CUTE! WHO WANTS A FISH!? YOU DO! YES YOU DO! 2. Pogo Stick Basketball Quick, what’s a sport that involves lots of coordination and a childhood toy that really isn’t that great? If you answered soccer and hula hoops then you’d be right, but I hate you, so I’m picking basketball and pogo sticks. To understand why this would be so amazing, go to Youtube and check out the geniuses who think they can manage “mad stuntz” on pogo sticks, and then imagine your least favorite professional NBA players eating it on the court like there’s no tomorrow. Kobe got you down? Faceplant. LeBron too cocky? Bounce face first into the rim. The comic possibilities are literally endless. 3. Underwater Ping-Pong (with electric eels) Ping-Pong is a pretty cool sport, but it can get repetitive after a while. So, how to liven things up? Well if Frankenstein has taught us anything, it’s that everything is better with electricity. So, how about we put those bad-body ping-pong players underwater in scuba suits, but add the awesome element of electric eels swimming around with them. Not only does it add additional strategy (hit an eel while its near your opponent and watch the fun! ), but it also turns a sport that’s heavily skill based into something that has the ever-so-beautiful element of chance. Come on, it’ll be electrifying. Don’t pretend you didn’t see that joke coming. 4. Frisbear No, that wasn’t supposed to be Ultimate Frisbee (the king of all sports). I’m talking Frisbear. In this game-for-the-whole-family-even-the-kids-who-can’t-talk-yet, you put on a giant robot suit and toss grizzly bears in a rousing game of Frisbee. Sure there’s danger involved, but you’re in a robot suit! What could go wrong? And BEARS! Bears make everything both deadlier and more awesome (especially Bear Pong!). Just think about the commercial possibilities on this one. Sure, it’ll piss off animal rights advocates, but it has robots, so who cares? THIS IS AMERICA.